Boeing has begun several months of flights with ecoDemonstrator 757 to evaluate new technologies to improve commercial aviation’s efficiency, reduce noise and carbon emissions. 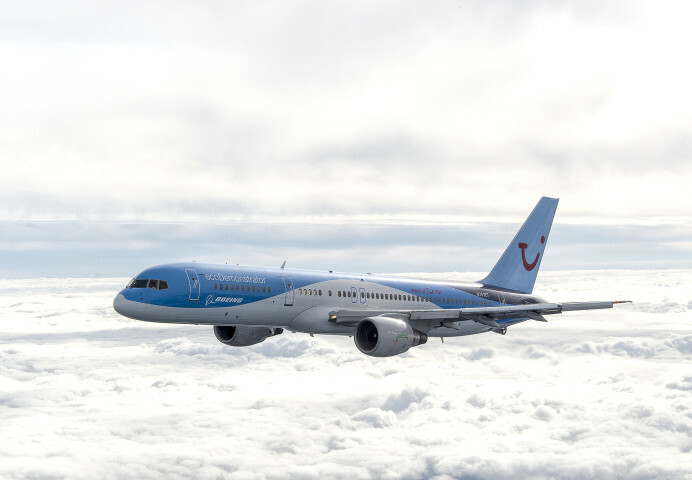 Boeing is collaborating with TUI Group and National Aeronautics and Space Administration (NASA) on ecoDemonstrator 757 tests. The 757 flight tests continue the ecoDemonstrator Program’s multi-year effort to accelerate testing, refinement and use of new technologies and methods that can improve aviation’s environmental performance. On the right wing, NASA will test bug-phobic coating to reduce the residue left by bug strikes on the leading edges of aircraft wings; the goal is to enable more drag-reducing laminar flow over the remainder of the wing. On the vertical tail, NASA and Boeing are testing active flow control to improve airflow over the rudder and maximize its aerodynamic efficiency. TUI Group, the world’s largest integrated tourism group, is collaborating with Boeing as way to reduce carbon emissions. 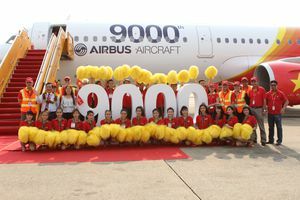 Airbus has celebrated the delivery of its 9000th aircraft at a ceremony in Hamburg, Germany on March 20th 2015.The aircraft is the first A321 to be delivered to Vietnamese carrier VietJetAir and will join the carrier’s all Airbus A320 Family fleet flying on its Asia-Pacific network. 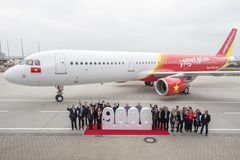 VietJetAir first took to the skies at the end of 2011 and now operates a fleet of 22 A320 Family aircraft on a network covering Vietnam and a growing number of destinations across Asia. The A321 delivered is the first of seven ordered by the airline as part of a major aircraft acquisition plan for up to 100 A320 Family aircraft announced in 2014. Since delivering its first A300 in 1974, Airbus has developed a comprehensive product line. Today this includes the single aisle A320 Family and the A330 twin Aisle, the A350XWB and the world’s largest aircraft the A380. The fifth and final test vehicle for the initial CS100 version of Bombardier’s CSeries airliner has begun flying, but additional aircraft will be used in the test program in a bid to meet the target of certification toward the end of this year. Aircraft FTV5, the first CSeries fitted with a finished interior, made its first flight from Mirabel, near Montreal,on March 18. A second followed March 19.The aircraft is being used to test passenger-related systems. CSeries testing has passed the 1,200 hour mark, but the total now includes flying FTV7, the first test vehicle for the stretched CS300, which made its first flight from Mirabel in February. Bombardier has said certification is expected to take around 2,400 hr. To meet its certification target this year, Bombardier plans to use the first production CS100 in the flight-test program. The first CS300 will also be used to fly test points for the smaller CS100, said Rob Dewar, vice president for the CSeries program. This is because of the high degree of commonality between the versions. Firm orders for the CSeries still stand at 243 aircraft, but total commitments including options are now 603. This includes a letter of intent to purchase 20 CS100, with options for another 20, for the new airline Flymojo announce by the Malaysian government on March 17. 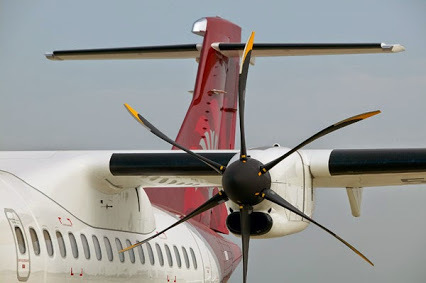 Air Madagascar has ordered three ATR 72-600 turboprops in a deal worth approximately $77 million, and is leasing two more of the type from Ireland based Elix Aviation Capital. The first of the two leased aircraft was formally delivered on March 11th, with the second due to next month. The Three purchased from ATR will be delivered from 2017. The arrival of the aircraft will enable Air Madagascar to renew and expand its fleet of ATRS, which currently consists of one ATR 42-500 and two ATR 72-500s,significantly increasing seat capacity on the carrier’s main domestic routes on the Indian Ocean island nation. 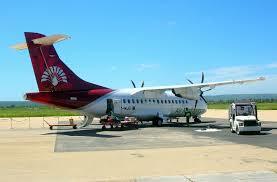 Air Madagascar transports nearly 600,000 passengers annually, with 75% of those on its regional or domestic network. The carrier is long standing ATR customer, having introduced its first of the type, an ATR 42-300,in 1996 and introducing the -500 since 2005. Singapore flag carrier Singapore Airlines (SIA) has been in talks to buy around 20% of Korean low-cost carrier(LCC) Jeju Air in the lead up to its initial public offering later this year. In a statement to the Singapore Stock Exchange, SIA confirmed ”that discussions have taken place on possible equity investment in Jeju Air.” SIA added that further public announcements could be on the way. The deal would give SIA Group considerably more access to expanding Korea-China market, where full service carriers are seeing high levels of competition from other LCCs such as Air Busan, Eastar, Jin Air and T’Way. SIA started talks to buy into Jeju Air with its parent Aekyung Group late last year, prior to the LCC’s plan to go for a Q4 2015 IPO to raise $180 million for expansion of its fleet and network, principally deeper into China’s second tier cities. 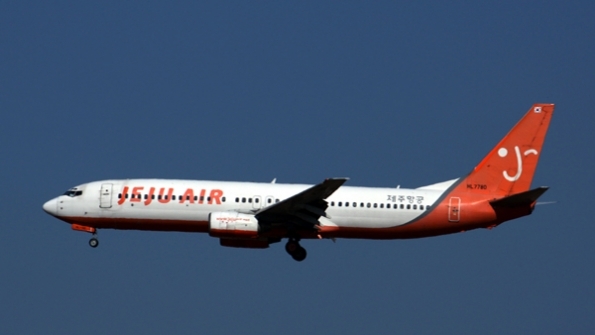 Late last month, Jeju Air introduced a new 3 weekly Daegu-Beijing service using Boeing 737-800 aircraft. 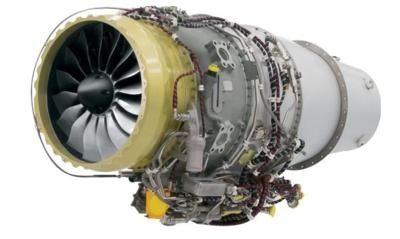 GE Honda Aero Engines has cleared a key milestone for its HF120 turbofan, which powers the HondaJet light twin-engined business jet, with the US Federal Aviation Administration granting production approval for its new manufacturing plant in Burlington, Massachusetts. This validation comes more than two years after the 2,095 lb thrust engine, developed by GE Aviation and HondaJet,secured US approval. It allows the company to build the powerplant to type design specification without FAA oversight. The $4.5 million HondaJet is the first platform for the HF120, although it has also been selected by US engineering company Sapphire for its Cessna CitationJet upgrade program. HF120 production was initially performed at Ge’s Lynn, Massachusetts, facility before its transition to Burlington late last year. The 2,000 square feet plant has capacity to build 500 engines a year. It will also carry out engine maintenance, repair and overhaul work. 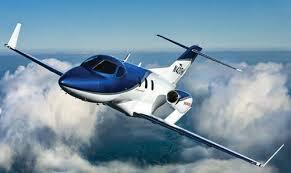 The HondaJet is scheduled for certification and service entry in the coming weeks. The six-seat aircraft is being assembled in nearby Greensboro, North Carolina. This past December, LAN Cargo set a new monthly record for the transportation of mangoes from Peru to Europe, shipping 525 tons of the tropical fruit using two 767 freighters. The mangoes were flown from Lima to Sao Paulo, there operations teams at Guarulhoes ensured that the cold chain was maintained before onward shipping to Europe. 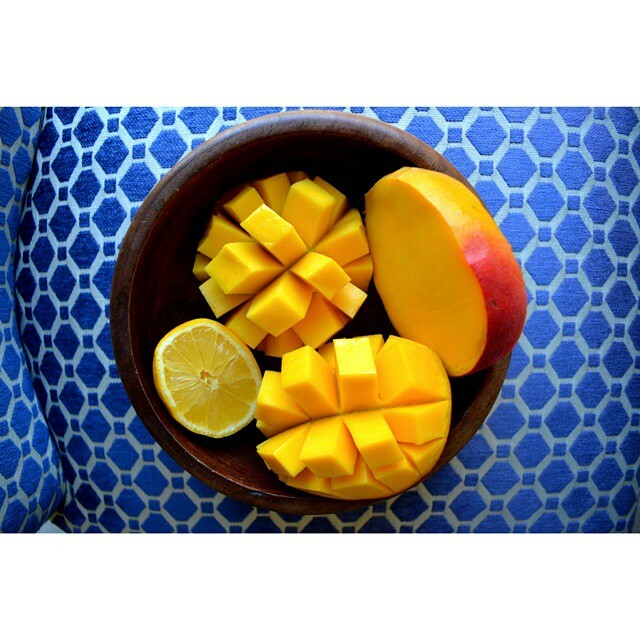 LAN is responsible for transporting approximately 35 percent of Peruvian mangoes to Europe. Expect tropical salads to be a big hit this year on Parisienne cafes. Rockwell Collins was selected by China Eastern Airlines to supply avionics, including Head-up Guidance System for its 20 Boeing 737NG starting in 2016. Avolon delivered the first of four Boeing 787-9s to Virgin Atlantic, which has a further line in its fleet. Boeing Shanghai Aviation has signed a maintenance agreement with Russia’s Transaero Airlines for its Boeing 767s. Swiss International Airlines (SWISS) has announced a commitment to purchase three additional 777-300ERs. The order will be posted on Boeing’s Order and Deliveries website when finalized. ANA finalized an order for three 787-10 Dreamliners on March 2nd.. The order was announced as a commitment in January of this year. Turkish Airlines has placed a firm order for four additional Airbus A330-200 freighters that will be operated by its Turkish Cargo business. The Industrial & Commercial Bank of China (ICBC) has placed a firm order for 30 Commercial Aircraft Corp. of China (COMAC) ARJ 21-700 regional aircraft. 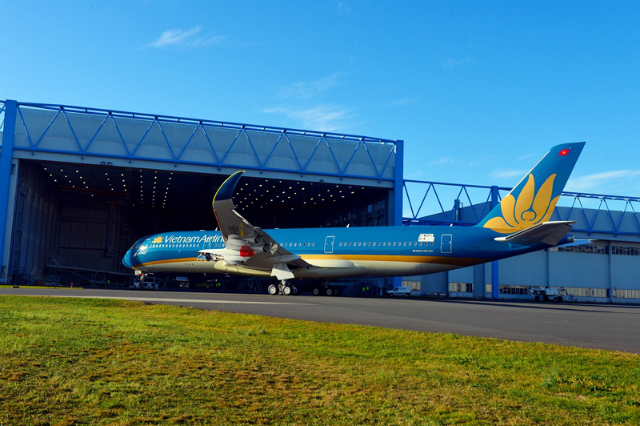 Vietnam Airlines’ first Airbus A350-900 aircraft has left the paint shop, revealing a new livery for the carrier. Qantas’s first 747-400 has flown into retirement after completing an historic ferry flight to Illawarra Regional airport on March 8th. Sukhoi Civil Aircraft Company (SCAC) is going to deliver 44 Sukhoi Super Jet 100 jets in 2015. BAE was selected by Boeing to supply the final piece of the revamped fly-by-wire control system on the 777X currently in development. Air Tahiti Nui (ATN), the major carrier of French Polynesia, has decided to order four Boeing 787-9 aircraft to replace its fleet of Airbus A340-300. Pilatus Aircraft recently delivered its 1300th turboprop PC12 to Surf Air,a private air travel club based in California. 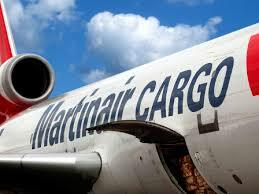 In the Netherlands, it appears that time for talking has ended, as Air France-KLM has taken the axe to subsidiary carrier Martinair. Meanwhile, on the other side of the world, Taiwan based EVA Air is looking to the future, with plans to place an order for five 777Fs. 330 employees, including 110 of the carrier’s pilots, would be let go. On the fleet side, all six Martinair’s MD-11Fs will be retired, leaving Air France-KLM with two 777Fs based in Paris operated by Air France and three 747-400Er based in Amsterdam. In Taiwan EVA Air reported strong growth in both cargo traffic and cargo revenue this year, while the carrier plans to reduce the number of freighters in its fleet, it has also made a decision to refleet with new production 777Fs. 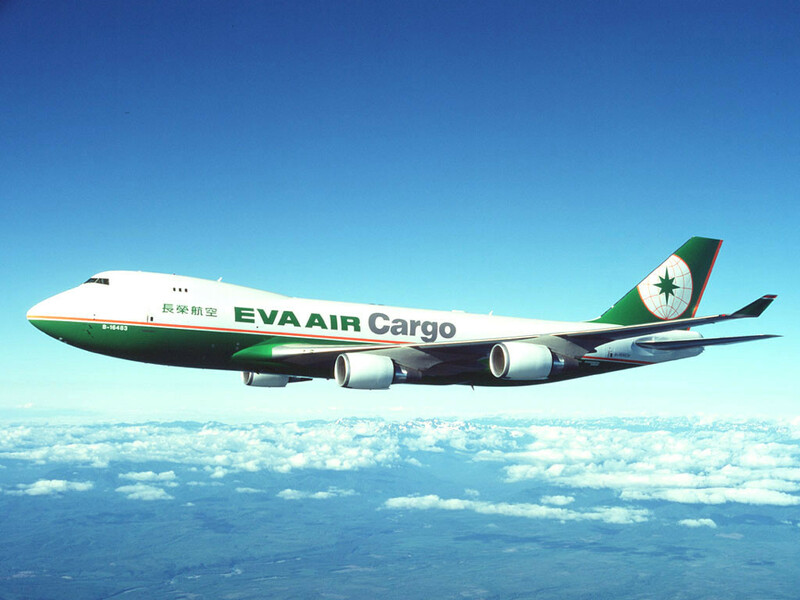 Eva Chairman Chang Kuo was recently quoted in China Times as the first phase of a massive fleet renewal will involve replacing its eight 747-400 freighters with five new 777Fs. There has been no announcement about the timing of the order but recent reports in China Aviation implies that it will be sooner, rather than later. As a docent at the Museum of Flight in Seattle located at Boeing Field I thought I knew most airline liveries, however, while on duty as a docent the past few weeks I kept seeing one of Northern Air Cargo planes parked not far from Clay Lacy’s hanger on the field and asking myself who is Northern Air Cargo and decided to investigate and discovered that Northern Air Cargo is the cargo carrier that assists the Iditarod Trail Sled Dog Race called “The Last Great Race” that has been held in Alaska since 1973. 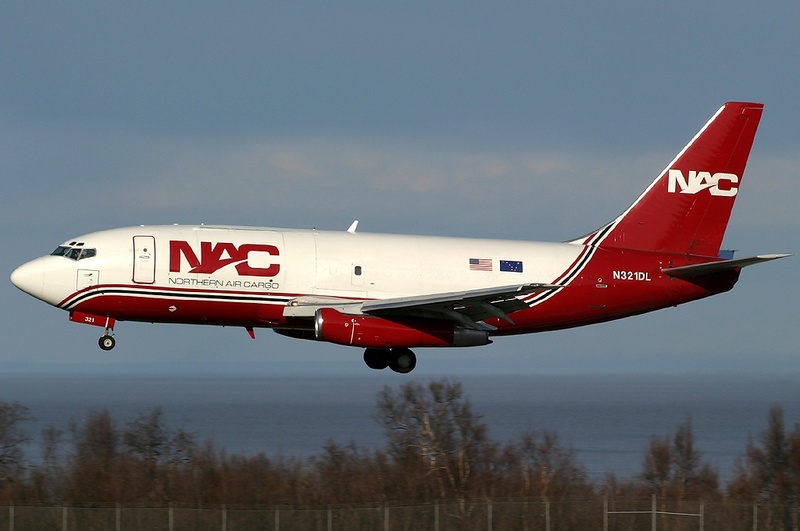 Just like those early mushers, Northern Air Cargo (NAC), Alaska’s largest all-cargo airline, also delivers goods in support of that race that celebrates their arduous journey. This year the ceremonial start was held on March 7th in downtown Anchorage, as usual, but the actual race started in Fairbanks due to lack of snow. NAC was there in its 33rd year of ferrying about 75 tons of dog food, sleds, kennels, snow machines, chain saws, camera equipment, plywood, heaters, propane tanks, perishables and general gear to support the mushers and their dogs. The carrier uses a 737-200 freighter and a 737-300 freighter for the race, operating one flight a day, three or four days a week, to drop supplies at three hub locations along the trail-the towns of McGrath, Unakakleet and Nome, where the race ends. No stranger to flying in sub-zero conditions, NAC, founded in 1956, flies to 14 points in western and northern Alaska. One of NAC’s largest customers is the Red Dog Mine, a zinc-lead mine in Northwest Alaska near Kotzebue, which NAC has been servicing for 20 years. The oil companies that are active in Prudhoe Bay, at origination of the Trans-Alaska Pipeline, are also frequent customers. Interesting discovery on my part. I also discovered that NAC is also tied to freight routes in much warmer-even tropical climates. When Hawaii’s Aloha Airlines went bankrupt in 2008, Saltchuk Resources, which bought NAC in 2006, bought the air freight portion, Aloha Air Cargo, based in Honolulu, which is predominantly inter-island service, with one weekly frequency between Los Angeles and Hawaii. using a 767-300 freighter. Dave Squire is the chief operating officer for both NAC and Aloha Cargo in Hawaii which make up the vast majority of Northern Air Service’s business. The company also keeps a couple of aircraft in Laredo, Texas, for expedited on demand charters, mostly carrying auto parts between the U.S. and Mexico. Approximately 68 percent of cargo on NAC carriers freight and 32 percent is mail.